So when news simmered that tvN was looking to do a second season, I was both excited and apprehensive. I figured it would go one of two ways, they could either do a true season two with the cast coming back to reprise their roles or do a Answer Me inspired reboot where they take the idea or the spirit of the show and spin it off with different characters (allowing of course for fun cameos of the original cast). There are drawbacks for either option are high. First option? Cast comes back. Seems good, right? Didn’t I just say we didn’t get enough of the main couple being cute and possibly skin-shippy together? Wouldn’t this be a good thing? Hold your horses–I just don’t think there is enough story there to warrant a second season. Everyone was all wrapped up in pretty little contented bows. If they go back there they either have to sit around just looking at each other or the writers are going to have to take something away, break up the couple, add in a weird twist. And I don’t know about you guys, but I like my couple just where we left them. Option 2–recast. This probably makes the most sense, right? If I don’t like option one then 2 must instantly be better, right? Oh how quickly you forget just how fickle I am. The thing I loved about that show was the quirky characters, this rag-tag group of people bonding through their love of food. It just wouldn’t be the same with another cast. And besides? How would the story be complete without Do Joon’s character taking his moment to stop the action with a diatribe on whatever food like item is in front of him? Apparently tvN thought the same thing. News broke that the production was courting Doo Joon. So we all thought they were going to go with option one, same cast, different season. Okay, well, we can live with that. Then the other shoe dropped. NONE OF THE OTHER CAST ARE COMING BACK! What the mother lovin’ fudge is going on over there? This really, really bad idea makes those other ideas go “Bet we’re looking pretty good right about now.” How can they ever think that taking our hero from our original cute story and putting him in a different story alone makes any sense? How are they going to explain away the girlfriend? If they write it that they’ve broken up and he’s trolling for someone new there is going to be rioting in the streets. (Or at least just my street.) We don’t want to see him paired with anyone else! I once had a writer I really liked. She once wrote a series and in the first one the couple gets together, the second story is their daughters story–no big deal there, right? Except in the first few pages you learned her mother died horribly a short time after the first story ended and the father remarried. I instantly put the book down, never to be picked up again, and then NEVER read that author again. Ever. Ahem….I hold grudges. Big ones. I don’t want to put that much time and effort rooting for a couple just to know that it didn’t work out–this is why I have such a problem watching high school dramas–I just have trouble believing they are in it for life. It’s actually one of the reasons I have trouble watching American TV shows. You root for your couple to get together, they finally do and then, during next season’s sweeps, out they go. I’m like a duckling–I like to imprint on my couple. If Kdrama goes this way, where am I going to go now? Of course, there is a possibility, a teeny possibility, that I’m over-reacting. It’s possible that they are going to pull a season three of God’s Quiz and send the girlfriend out of the country to ‘study’ and the hero goes off alone, but still part of the couple, to do whatever circles the new plot requires of him, leaving the possible romantic line to the b-leads. Ho-hum. I am still not pleased–and I’m guessing I’m not going to be alone. Usually I’d say I trust tvN to know what they are doing, but while they do have some of the very best programming out there–they have had some dramas which haven’t been super effective. 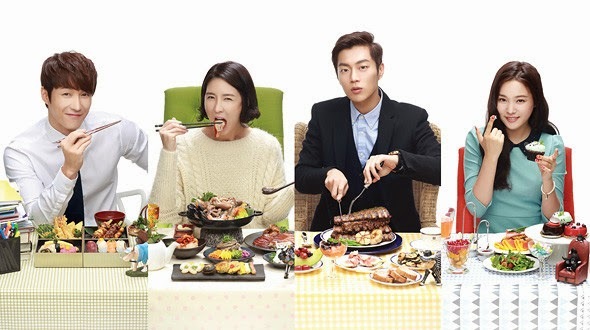 Or dramas that I don’t want to watch and unfortunately–I think they’ve taken a drama I really liked–and turned it into one of those not horrible, but not terribly good stories. I guess we’ll keep an eye out for more information as it comes in, but for right now–tvN, I hope you can see the major case of stink-eye I’m giving you.